Costumes and Pumpkins and Treats, Oh My! We hear your little girl just saw The Wizard of Oz for the first time, after hearing the story at bedtime for years. And, well, we know how this goes...the first viewing turned into the 100th viewing, and now your child is completely obsessed with Oz. Can you blame her? You remember how it felt to watch the black-and-white world change to Technicolor as Dorothy opened her door to Munchkinland. And you remember the thrill (and a little fear) when the wicked witch cackled, "I'll get you, my pretty, and your little dog, too!" So, don't make her go over the rainbow to make her Halloween dreams come true. 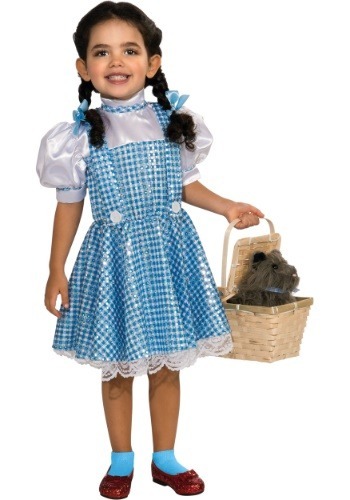 Just get her this Wizard of Oz Toddler Sequin Dorothy Costume—officially licensed and totally adorable! It looks just like the outfit Dorothy wears in your kiddo's now-favorite film, but it's even better because it's shiny. Dress as another character from Oz and accompany your sparkling little Dorothy around the neighborhood, pretending the sidewalk is the yellow brick road! This iconic costume comes as a one-piece dress styled to look like a pinafore over a white blouse. The "blouse" is shiny white and the rest is Dorothy's signature blue-and-white gingham print. However, this outfit boasts a little something extra—sequins! You'll also get two blue hair ribbons so you can plait your little one's hair into braids, like Dorothy's, but you'll need to pick up the petticoat, ruby slippers, and basket (and Toto, obviously) separately. It won't be long before your little toddler is taking off on her own real-world adventures, so cherish this time with her as you share your mutual love of this classic film. In our opinion, it's never too early to teach your kid that there really is no place like home!